After a long day at school, this is how I spent my evening. A 35-minute stint on the treadmill followed by a 20-minute recumbent bike ride. Good times! 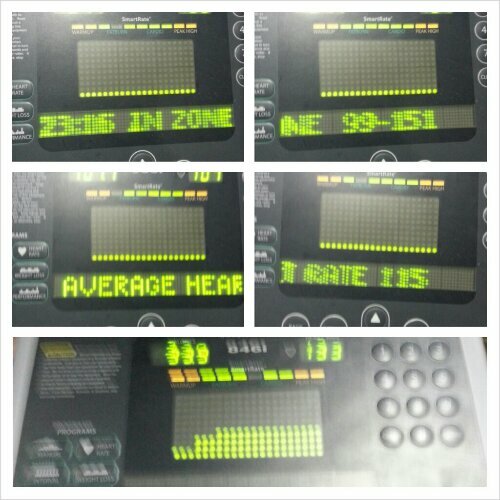 As much as I hate the treadmill because you don’t go anywhere, I actually enjoyed my workout. I could have gone longer, but elected not to so that I could ride the bike as well. Spending time with the cardio machines at the gym…not brave enough to do the elliptical just yet, so the treadmill and bike will do for now. I am hopeful that my near-hour of hard work will result in good sleep tonight. I have been lacking good solid sleep lately, and need to work on that. Yet here I sit, finishing up this blog post at 11:10 pm. So I’ll move on to the food and be done with it. I was a low-carbing protein beast today: 114 grams, 30 grams carbs and 42 grams fat. All my proteins today were super lean cuts of meat and fish, so I felt good about what I ate today. I did try to squeeze in some more veggies today, with moderate success. If I thought it made practical sense to buy a bagged salad, I’d buy one to get some greens in, but it just isn’t practical for me to buy one since it would go bad before we had a chance to finish the thing. Perhaps buying a small container from the salad bar might be a good alternative. I do miss salads and I haven’t had one in nearly 6 months. I think it’s pretty safe to say my sleeve can tolerate them now, so perhaps next week’s trip to the grocery store will include a quick trip to their in-house salad bar to buy a small box of mixed greens. 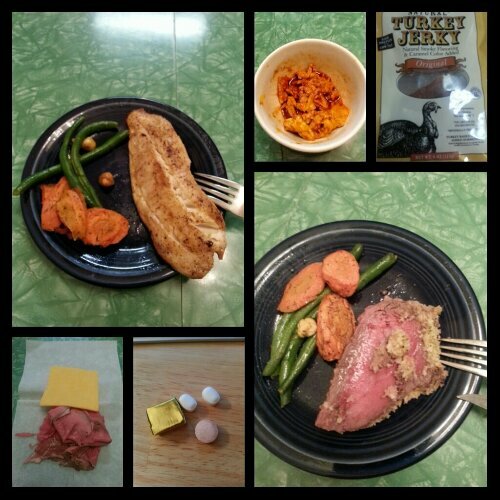 Today’s food choices, from upper right: Trader Joe’s turkey jerky; herb crusted beef tenderloin with green beans, roasted carrots and hazelnuts; multivitamin and calcium supplements x2, iron supplement; Central Market house made seasoned roast beef and slice of Tillamook cheddar cheese; tilapia filet cooked in lemon butter with same veggies as earlier (I didn’t eat the green beans though); 99% lean ground turkey with Rufus Teague touch o heat barbecue sauce and melted cheese. This entry was posted in daily bites, eating, exercise, oh behave!, post-op, the sleeve, vsg, weight loss surgery, werk! and tagged benefits of wls, daily bites, eating, exercise, I work out, oh behave!, post-op eating, post-op life, she's got skillz, sorry for sleeve rocking, VSG, vsg realness, WLS, workin' on my fitness. Bookmark the permalink.